Markowski Excavating, Inc. is a family-owned business, originally founded by Peter Markowski Sr. who owned and operated a dairy farm in Florence. In 1963 Peter traded two horses and $1,700 to purchase his first bulldozer. Over the next several years he did various landscaping and residential jobs. The transition from farming into landscaping/excavation was complete in 1966 at which time Peter purchased a brand new Caterpillar 922 loader (this loader still operates in the fleet today) and focused full time on landscaping and excavating. One of the first commercial projects was the demolition of the old Rutland rail yard and grading for the new buildings now known as the Rutland Shopping Plaza. 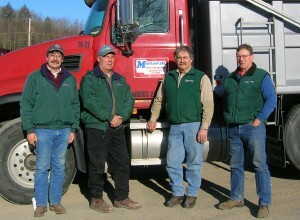 While attending highschool and college, sons David, Marty, Sam and Greg continued to work during the summer months, weekends and school vacations with their father. In 1974 they decided to from a partnership, and the business was incorporated to Markowski Excavating, Inc.
Due to a fire in 1985 the buisness was relocated from the family farm in Florence to West Creek Road where it continues to operate. Throughout the following years the company grew with the development and construction trends. From a “Mom & Pop” company in the early years to present day seasonal peaks of 60 plus employees. The company operates four aggregate pits/quarries supplying materials for their numerous projects, other contractors and many municipalities with stone, sand and gravel. Projects range from residential home site developments, atheletic fields, industrial site projects, housing and condominium site work, municipal and state highway road and bridge construction, water and sewer line installation throughout the region and golf course construction at the Proctor-Pittsford Country Club. The Company has expanded its abilities to owning and operating as an aggregate recycling facility in Brandon, and custom crushing service to area gravel pit operations. Through dedication, determination and hard work, brothers David, Marty, Sam and Greg have built their reputation, which they proudly uphold today.